​Q: How to secure my game? How do I get back my account if I change devices? Tap "Secure Game ID" in "Settings". Secure using Facebook or Email Address. You can check whether your account has been secured successfully in Settings. Before you change Device, please Tap "Save Server Data" in Settings to save your game to cloud. After changing Device, please Log In with the same credentials. If Secure or Restore fails, please try again with stable connection or different Wi-Fi. 1 email address or Facebook can only be bound to 1 account. Once an account is bound, you can't change it. Q: What to do if I lost my game and the game went back to Lv 1? A: If you've secured your game, reinstall and log in with your credentials. Q: Why doesn't stocks reset? A: Now, stocks reset every 30 minutes only if you are online. ​Q: The game is bugged!!! A: Contact mojo@happylabsfree.com and we will help you resolve your problem. Q: How do I save my game data? A: You can log in with your Facebook account or Email Address. Note: You can’t retrieve your account if you forget the password tied to your self-defined user name. You cannot bind your account to Facebook after binding with our ingame user name and password. Please don’t forget your password! Q: Why are there advertisements in the game? A: You can remove the advertisements completely, by performing a one-time in-app purchase. The ads keep us alive and let us develop more new games for you! Q: How do I get Mojo furniture? A: Give your ID to a friend. Have the friend insert your ID to get a free room. You'll be able to unlock 1 Mojo furniture for every user who unlocked their free room. A user can only enter the ID once in his/her lifetime, so you'll need to invite 15 different people for the full set of Mojo's furniture. Q: Where can I find Quests and what are they for? A: Tap on a Pet portrait on the top of the screen, and it will lead you to the respective Pet who will then issue a quest that needs to be done. You may choose to accept or reject the Quest. Upon completion, depending on the quest, you will be able to gain XP points, coins, clovers or decos and costumes as rewards. Tap on the Giftbox icon to retrieve the rewards. Q: How many Quests can I get at one given time? A: You can receive up to a maximum of 2 Quests from any townies available, and 1 special Mayor Quest. Q: What are Theme Quests and what must I do to complete it? A: There are 2 types of Theme Quests - Fashion and Home. Fashion Theme quests requires you to dress up your pet according to the fashion theme, for example, Uniform, Rocker theme. Similarly, players must decorate their main room according to the required Home Theme, for example, Modern, Egyptian theme. You can check your theme points by speaking to the quest giver. Q: How do I get Mojo furnitures in Social screen? Q: How do I change my Pet’s name and greeting? A: Tap on your Pet’s avatar on the top left UI to change to your desired name and greeting. Q: How can I change my pet’s appearance? A: Speak to Barnie in the Fashion Shop and tell her, “I’m ready for a makeover!” to change your pet’s looks. Q: Can I save my current look before changing my pet’s look? A: Yes! Use the Magic Mirror in Fashion Shop to save your current appearance. Q: What are Home Points used for? A: Home Points are used for ranking players on the Happy Homes Leaderboard. The more the Home Points, the higher the chance to get ranked on the leaderboard. Q: Where do I view my Home Points? A: Tap on your Pet’s avatar and you will get to see your Home Points on the bottom-left corner. Q: How do I get more Home Points? Q: Where and how to to sell unused items? A: Enter any shop (Cafe, Salon, Fashion, Furniture) and talk to the shopkeeper. Tap on “I want to sell something” to sell off an item in your Inventory. You should sell items from time to time to make space in your Inventory. Sell certain items to the correct shopkeepers, and you can bargain for a higher price! Q: How often do the items in the Furniture, Fashion and Salon shops in my town restock? Do they only restock only when all items are sold out? A: The shop items will restock every four hours or when player enters the shop, whichever is later, regardless whether items are sold out. Q: How can I get more decor and costumes that aren’t available in my shop? A: Visit other townies’ home and check out their shops for a bigger variety of items to buy! Q: What are the things I can do in the Cafe? A: The Happy Homes leaderboard can be viewed by tapping on the portrait of pets hanging on the wall. You may visit any player ranked in the leaderboard, and check out other pets that are hanging out in the Cafe. You may also purchase food from the Cafe to feed your pet when they are hungry. Q: How do I find more friends to play with? A: Tap on the Random silhouette in Social screen or speak to Thomas to visit random players! 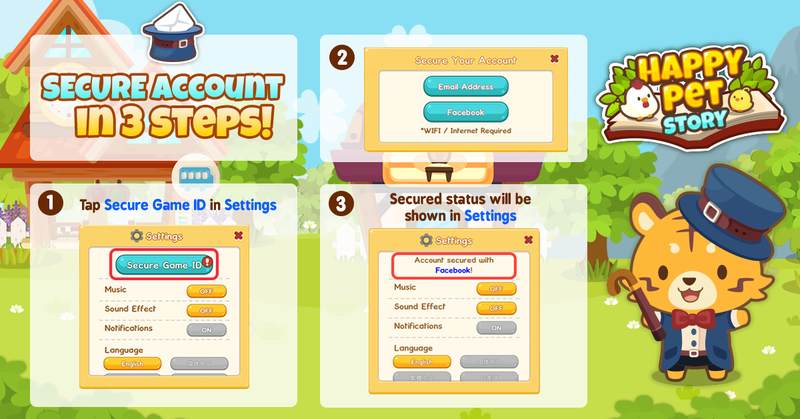 You can also connect to Facebook to automatically add your Facebook friends, or share your ID with other players so that they can add you. Q: Where do I find my game ID? A: Find your Game ID under the Social button at the bottom right game menu. A: Tap on the Social button and select “Find ID” or “Find Name” to add your friends. Q: What is “Invite Bonus” for, and how do I use it? A: You may key in any player’s ID to redeem a FREE room under the “Invite Bonus” tab, found in the Social button. You can also share your Invite ID so that if friends or anyone key in your ID, you will get to unlock exclusive Mojo decorations that can’t be bought anywhere. Q: Can I chat with my friends? A: You can send Greetings via mails to your friends. Q: What does “What the fish” means, when I strike a conversation with Calvin? A: It costs coins to view the fish album for Fishes of the Hour. Which means that you can view the different fishes that is available at different hour of the day. There will also be different fishes appearing in different seasons. Q: Why should I discover all the fishes in Fish Album? A: You can get special fishing rewards by completing each page in Fish Album! Q: What are the farm plots for? A: Harvest money plants and XP plants to speed up your progress in the game! You can move the farm plots by using long-press. Q: How many farm plot can I get to unlock with each level up? A: Farm plots are unlocked based on levels, but you may not get farm plots with every level up. Q: What are the balloons for? A: Pop them to get coins. Sometimes, random clothing and furnitures will drop onto the ground! Q: How to get FREE diamonds? A: Sometimes, when you chat randomly with townies, or tap on critters, you can get a diamond! Q: How to quickly earn coins?